In the movie Wall Street, the iconic character of Gordo Gekko told a young Bud Fox, “Don’t get emotional about stocks.” While the movie is fictional and Gekko was using inside information, there is tremendous value in the advice he gave. Don’t get emotional about stocks. After the huge selloff on Wednesday, many investors are probably feeling rather emotional about their portfolios. Some will probably panic if they didn’t already. Others will be watching the market more closely over the coming days because of the selling. And still others will lose sleep because they are worried about having too much exposure to equities. None of these activities are healthy for your portfolio or for your health. There are two main theories about asset allocation—strategic asset allocation and tactical asset allocation. I have my own theory about asset allocation and it is a hybrid of the two. 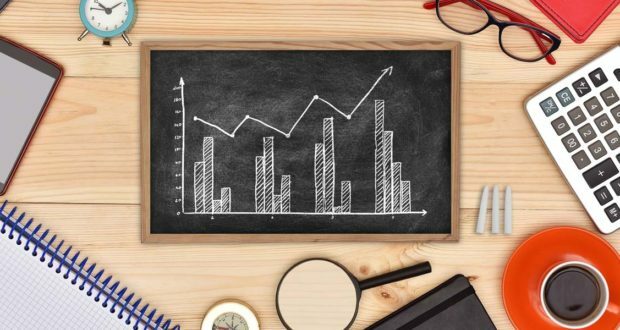 Without getting too deep into the differences between the two types of asset allocation, strategic asset allocation is based on an investor’s age and risk tolerance while tactical asset allocation is based on market conditions. For example, a basic form of strategic asset allocation says that if you take your age and subtract the number from 100, this will give you the approximate percentage of your portfolio that should be invested in equities. For instance a 35-year old would have 65% of their portfolio invested in stocks and 35% in fixed income (100-35=65). A 70-year old would have 30% invested in stocks and 70% invested in fixed income. Of course, this is a very basic methodology, but you get the idea. Tactical asset allocation uses more of range for the percentages based on market conditions. For instance the model portfolio may say the equity allocation has a range of 50-60%. If market conditions suggest stocks will outperform over the coming months or years, the allocation would be up at the 60% level. If market conditions are suggesting that stocks will underperform, the allocation would shift down to the 50% level. I personally believe in a mix of the two styles. There are times when market conditions suggest that a 35-year old having 65% of their portfolio in stocks is too much and at other times, 65% might not be enough. If the market is overbought and optimism is too high—a 65% allocation to stocks is probably too much for this young investor. Conversely, if the market is oversold and the majority of investors are pessimistic, 65% allocated to stocks probably isn’t enough. I put together a crude image to try to explain my theory. I apologize for the low quality graphic, but I am a writer and an analyst, not a graphic artist. The image depicts what I think the asset allocation of a 50-year old should look. The strategic asset allocation model would suggest that 50% of the portfolio should be made up of equity holdings and 50% should be in fixed income and other assets. I believe that the 50% mark should be a baseline with adjustments made based on market conditions. When the market is oversold and sentiment is bearish, the equity allocation should be moved up to as high as 70%. When the market is overbought and the sentiment is too bullish, the allocation should be moved down and could reach as low as 30%. So how do you decide when to raise or lower the stock allocation? I would suggest using a four-step process that uses sentiment and technical analysis. When the market is overbought based on a simple long-term overbought/oversold indicator like the 10-month RSI on the S&P 500. Lower your allocation by 10%. If we look at a long-term chart of the S&P, we can see that when the 10-month RSI hits 80, stocks can keep climbing, but the gains tend to slow down at that level. If a 50-year old had 70% allocated to stocks in early 2007, they would have adjusted their allocation down to 60%. They would have done this again 2013 through 2015. They would still have the bulk of their portfolio in stocks, but not a maximum allocation. They would have also dropped the allocation in mid-2017. Sure you may miss out on some up-side, but you also aren’t fully exposed to a downturn like we saw in 2000-2002 or 2007-2009. The second step is the sentiment. You could use the Investors Intelligence report or consumer confidence as an indicator of when to lower your allocation by 10%. If the bull/bear ratio on the Investors Intelligence report goes above 3.0 adjust your allocation down by 10%. Again, like with the 10-month RSI, you aren’t jumping completely out of stocks in 2003 or 2009, you are just lowering your allocation a little. You would also want to bump it up by 10% when the indicator goes below 1.0 like it did in late 2008 and again in early 2016. Another adjustment point could come from the S&P dropping below a long-term moving average like the 52-week moving average or the 20-month moving average. If you look back at the S&P chart, you would have lowered your allocation by 10% in late 2000, early 2008, and in mid-2015. These are adjustments that reduce your exposure before big downturns like 2000 and 2007. The 2015-2016 time period would have been a little more difficult as it waffled back and forth above and below the moving average. But these adjustments don’t have to be made in one day, they can be made over a period of weeks or months. One last adjustment you could make is to drop the stock allocation by 10% when one moving average crosses bearishly below another longer term moving average on the S&P 500. It could be the 13-week moving average crossing below the 52-week moving average, or the 10-month crossing below the 20-month. 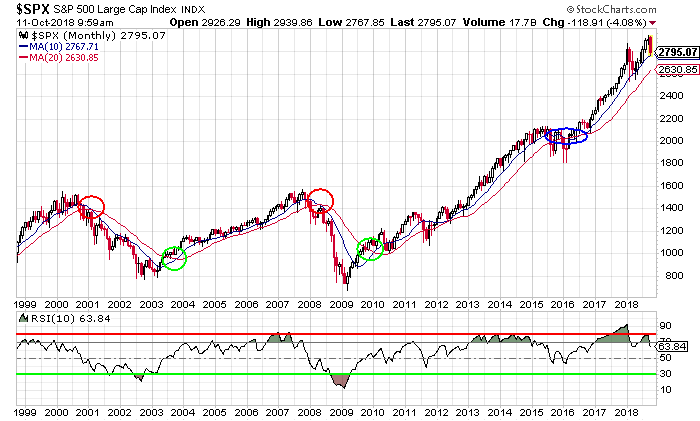 Once again if you look at the S&P chart, I marked the moving average crossovers with red and green circles. The red circles are bearish crossovers where you would have lowered your allocation and the green ones show bullish crossovers where you would have increased your allocation. You would have made this final adjustment to lower your allocation in early 2001 and mid-2008. The 2015-2016 period would have been confusing again, but I think it would have been worth it to avoid a big drop like the earlier two periods. Is this asset allocation method perfect? Of course not, no asset allocation method is perfect. Can this asset allocation method help you make adjustments to your portfolio so that you avoid big losses in your portfolio? Yes. And avoiding big losses is just as important as capturing big gains when it comes to building wealth. These four factors can help you use common sense to make portfolio changes and they give you points to look at so that you aren’t making adjustments based on emotion. Removing emotions from your decision making is critical to investment success. For amateurs in this market we need all the help we can get. So many articles seem to be written for broker types not us rookies..
Pre-existing conditions? NO! Wrong Problem. Insurance Must Change.